Women Networking | WOMEN Unlimited, Inc. | WOMEN Unlimited, Inc. The mission of The WOMEN Unlimited Network (The WUN) is to provide opportunities for its members to continue their growth and development and to foster the development of others. Benefits include: newsletters, webcasts, private LinkedIn Group, an invitation to participate in an IMpower or LEAD session, and mentoring opportunities. Membership in The WUN is automatic upon completion of the program and is offered with no annual membership fee. The WOMEN Unlimited Network (The WUN) program provides a way for WUI graduates to continue to gain leadership insight and ideas for contributing as a leader in their organization, while enjoying valuable connections with other cross-functional, cross-industry leaders. IMpower, LEAD and The FEW program alumnae continue their professional growth while fostering the development of others. The WUN program is available to all WUI graduates at no additional cost. Our corporate partners and their graduates have asked for a way to continue the development learning experience and deepen the relationships forged with their peers during the formal program. To fulfill that need, we created The WOMEN Unlimited Alumnae Network, The WUN. This program provides a way for WUI graduates to continue to further their career growth ~ while still enjoying valuable connections with other successful women leaders. 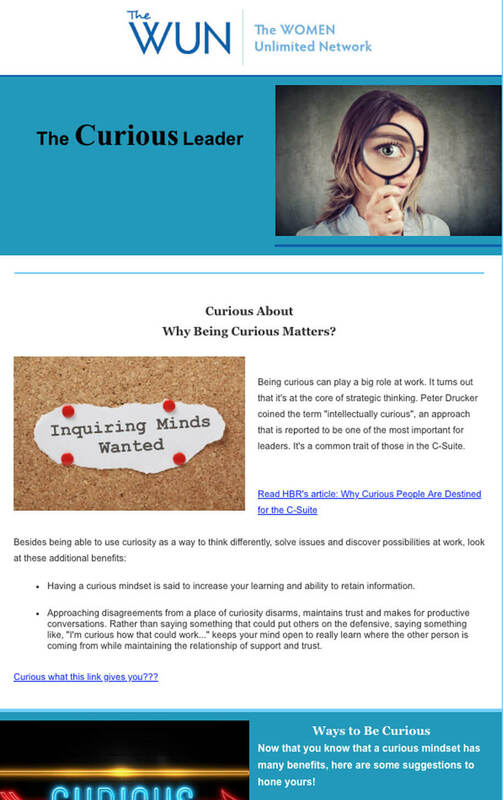 Insightful newsletters designed to be a quick read with valuable leadership tips and advice. Click here to view a sample newsletter. Live Webcasts led by impactful speakers and subject matter experts. As in the formal program, this virtual delivery allows The WUN participants to discuss key points and ask questions of the presenter. We are pleased to provide a “WUI fix” for our alumnae - a way to refocus and recharge. Alumnae are provided the opportunity to return to a favorite session to continue the learning, and to network with other talented women. The WUN LinkedIn Group, open to WUI alumnae only, gives participants the opportunity to continue great discussions, share valuable best practices and discover new ways of thinking, leading and adding value to their organizations. Take Time and Do…for YOU!